The KeyboardEvent shiftKey property in HTML DOM is a read-only property and used to return a Boolean value which indicates the SHIFT key is pressed or not. 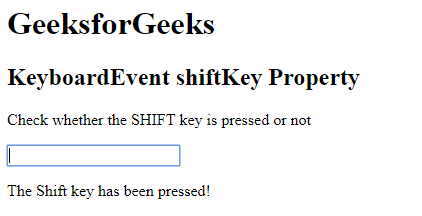 The KeyboardEvent shiftKey property returns true if the SHIFT key is pressed, otherwise returns false. Example: This example check whether the SHIFT key is pressed or not.